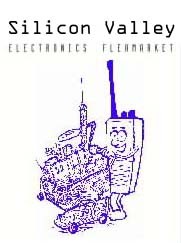 The Electronics Flea Market has moved to the east side parking lot at Fry’s Electronics in Sunnyvale. 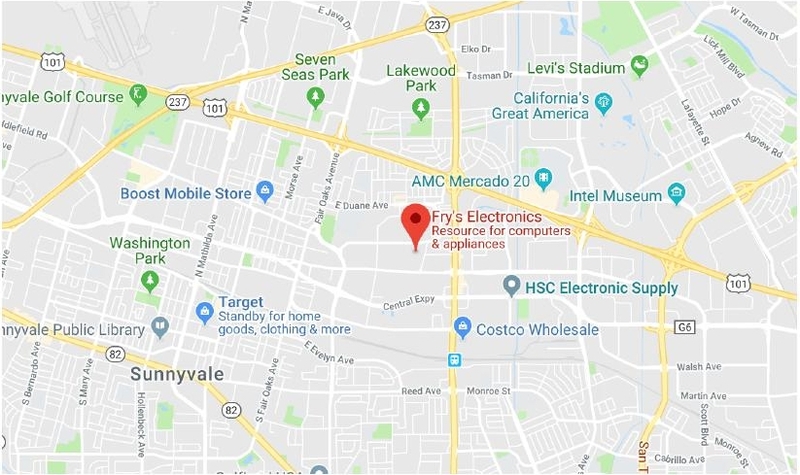 We are pleased to announce that Fry's has agreed to hold the 2019 season of the Electronics Flea Market in the parking lot at their store in Sunnyvale. Take Highway 101 south to Sunnyvale, then take exit 394 onto Lawrence Expressway south. Follow Lawrence Expressway south ~ 0.6 mile, then turn right on Arques Avenue. Follow Arques Avenue west for 0.3 mile and look for Fry's Electronics on the right (north) side of the street. Take Interstate I-880 or I-680 towards San Jose. In Milpitas, turn right (southwest) onto Route 237. Take Route 237 southwest to Lawrence Expressway, then continue south on Lawrence Expressway for 2 miles. Turn right on Arques Avenue and follow it west for 0.3 mile and look for Fry's Electronics on the right (north) side of the street. Take Highway 101 north towards San Jose. Continue on 101 north into Sunnyvale, then take exit 394 onto Lawrence Expressway south. Follow Lawrence Expressway south ~ 0.6 mile, then turn right on Arques Avenue. 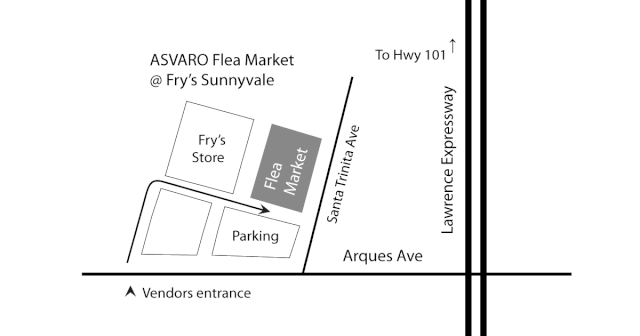 Follow Arques Avenue west for 0.3 mile and look for Fry's Electronics on the right (north) side of the street. This is a Google Earth satellite image of the Sunnyvale Fry's Electronics store and parking lot (north is up). 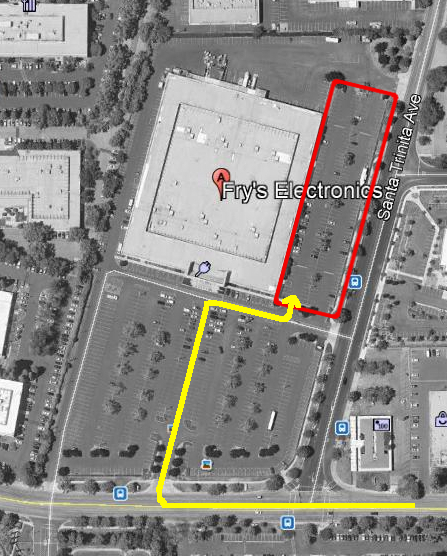 The vendor area is located on the right (east) side of the store mark in a red rectangle. The vendor gate entrance is located at the south end of the red rectangle. Enter the Fry's parking lot from Arques Avenue and work your way to the east side parking lot. The yellow line with the arrow head shows a route for getting to the vendor gate entrance.